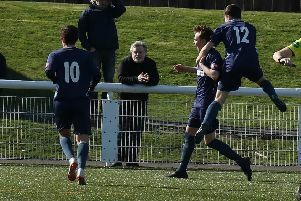 The games are now coming thick and fast as far as league leaders St Cuthbert Wanderers are concerned with the Kirkcudbright side playing catch up. Having played Mid-Annan dale midweek this week they now play Upper Annandale this Saturday followed by a midweek meeting with their only real challengers, Edusport Academy. If Saints can secure full points from these matches then their quest for the league title will be unstoppable. Having said that the Wednesday evening encounter at St Marys against Edu could be a very exciting and interesting contest to witness and a large crowd of spectators is expected to attend this match. Firstly though there is one match being played on Friday night and that is at Dumfries High School where Abbey Vale lock horns with Creetown for what should be a fairly evenly balanced match. There are another five league matches scheduled to be played on Saturday along with the Saints match with Crichton playing Lochar Thistle in a local derby in a match that could well see the points shared. Wigtown and Bladnoch travel to play Dumfries YMCA and should return with three points while Newton Stewart will be hoping that their long journey to Sanquhar to play Nithsdale Wanderers in the Creesiders final league match of the season is not all in vain. Edusport Academy will start as favourites to overcome Mid-Annandale for the second time in a week while Heston Rovers will be looking to win the three points at Gatehouse.